States join security alliances to increase their level of security vis-à-vis neighbours that may pose a threat. The deterrence logic that was the main rationale for joining NATO in 1949 still represents the cornerstone of Norway’s security policy. However, belonging to a military alliance can also pose challenges. 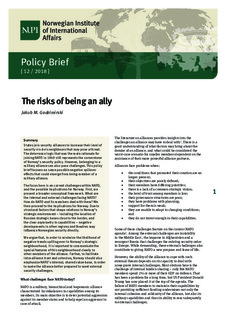 This policy brief focuses on some possible negative spillover effects that could emerge from being member of a military alliance. The focus here is on current challenges within NATO, and the possible implications for Norway. First, we present a broader conceptual framework. What are the internal and external challenges facing NATO? How do NATO and its members deal with them? We then proceed to the implications for Norway. Due to structural factors that shape relations in Norway’s strategic environment – including the location of Russian strategic bases close to the border, and the clear asymmetry in capabilities – negative developments in other regions and theatres may influence Norwegian security directly. We argue that, in order to minimize the likelihood of negative trends spilling over to Norway’s strategic neighbourhood, it is important to communicate the special features of this neighbourhood clearly to other members of the alliance. 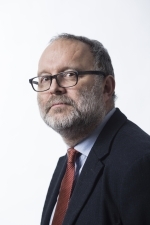 Further, to facilitate intra-alliance trust and cohesion, Norway should also emphasize NATO’s internal, shared value-base, in order to make the alliance better prepared to meet external security challenges.